VANCOUVER, British Columbia (AP) — Most of the usual suspects advanced to the Cup quarterfinals of the Vancouver Sevens on Saturday but not before a wild second round of matches that saw some of the top teams defeated in big upsets. 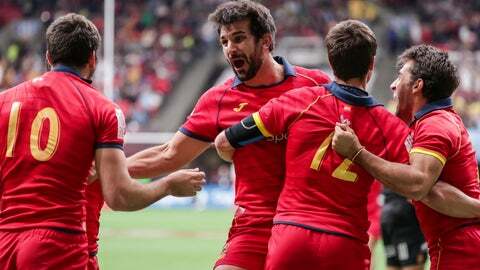 During the topsy-turvy round, France beat Australia 21-17, Spain edged New Zealand 26-24, Canada used the home crowd to upset Fiji 26-19 and the series-leading U.S. needed two late tries to beat Chile 33-19. In the end, the quarterfinals on the final day Sunday will see South Africa play Argentina, New Zealand play Fiji, England take on the U.S. and Samoa plays France. In Pool A, South Africa beat the U.S. 19-7 in its final pool match to finish with a perfect 3-0 record on top of its group, with the Americans second. In Pool B, Samoa and Fiji advanced with 2-1 records, leaving host Canada, which was also 2-1, out of Cup consideration due to an inferior points differential. Canada’s start to the tournament was a 38-7 loss to Samoa. The Samoans led 14-7 at halftime but McGrath felt his team was still in the game, given that the plan was to control possession and deny the Samoans attacking opportunities. Instead, he said, they did the opposite and gave the Samoans the ball. In Pool C, first-place New Zealand and France, thanks to its upset win over Australia, advanced, leaving the Australians out of the final eight. In Pool D, 3-0 England qualified first with 2-1 Argentina second. England and South Africa were the only teams to win all three pool matches. Coming into Vancouver, the U.S. led the overall standings after five tournaments with 98 points, five more than second-place New Zealand. Fiji was in third with 84, followed by England with 68 and South Africa with 67. After Sunday’s finals, the series heads across the Pacific for stops in Hong Kong from April 5-7 and Singapore on April 13-14.